Despite ceasefire arrangements villagers in Karen State are worried that unscrupulous local officials will force them off their farmland and business interests wanting the land for development projects. Recent cases of confiscated land in the Tontay Township region have seen local politicians take up the case on behalf of the villagers. Last week the Karen People’s Party said that it would report to the official departments in an effort to reclaim the seized lands of Tontay Township residents. The Karen People’s Party (KPP), Southern District chairman, Mahn Ohn Myint Thein, told Karen News that the Burma Army and the special investigation department seized more than 2,800 acres of farmlands in Yetwin Khone, Htawkhu, and Mayan Tapin villages an area where mainly Karen people livfarme. Speaking to Karen News, Mahn Ohn Myint Thein said. 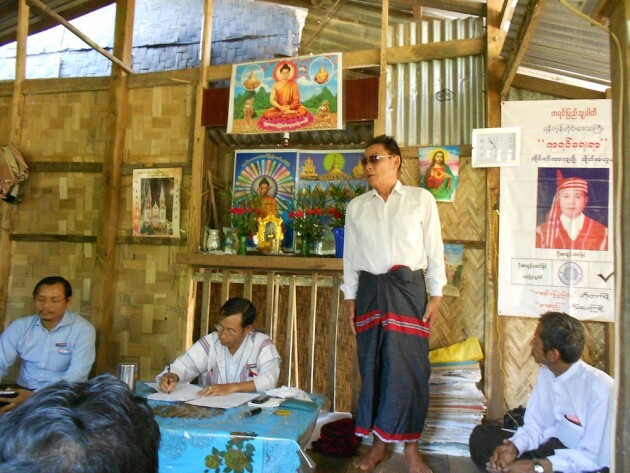 Mahn Ohn Myint Thein said that after the farmlands were taken from villagers’ private businessmen built fish farms, alcohol factories and rented out the lands for cultivation. Karen News met with U Aye Thaung from Htaw Khu village who built a fish farm on the seized lands and asked why he was able to work. In response U Aye Thaung said that he had received permission from the special department investigator-in-charge, Moe Kyaw Htoo, and from the Land Registration Department. The Htaw Khu farmland is estimated to produce 90 baskets of rice per acre. The Htaw Khu farmland area is renown for its capacity to produce healthy crops.